Murillo Thomas is the patron of studies in the Augustinian Order. Read here to find out why. He was born in the year 1486 in Fuenllana in the province of Toledo, Spain. At that time, Spain was at the dawn of a golden age of prominence, wealth and power in Europe. When Thomas was six years old, King Ferdinand and Queen Isabella financed the voyage of Christopher Columbus to the New World. The seemingly endless wealth that poured into Spain from conquest and trade produced a cultural explosion in literature and art. It also produced an excessive desire for wealth, some of which pervaded the Church in Spain. High positions in the Church could be bought for the right price. At times were occupied by men more interested in power than in spiritual goals.And, of course, the infamous Inquisition, which also was open to being used for financial gain, was at its peak. Thomas grew up in the middle of all this. He was brilliant. At the age of 16, he enrolled in the University of Alcala, rapidly obtained his degrees in theology and immediately joined the teaching faculty. As his reputation grew, so did his fame, and soon he was asked to be a professor at the very famous University of Salamanca. To the amazement of everyone, Thomas declined and announced his intention to became a member of the Order of Saint Augustine.He was less than thirty years old when he turned his back on the Golden Age. On 25th November 1517 he took vows of community life: poverty, chastity and obedience. In the following year, he became a priest at the age of thirty two years. Thomas possessed a great talent for leadership, and rapidly rose in the Order of Saint Augustine to become a regional provincial. He was among the first in the Order to think about the spiritual state of the colonies of the Spanish Empire. He promoted the organisation of a missionary band to minister to the peoples of the New World. 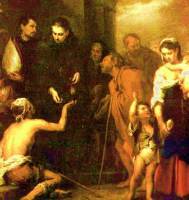 He also looked out for the poor people and those without hope who lived near the Augustinian community.